One of my favorite things about the green beauty community is being able to find the most amazing stores. That might sound like an odd statement, so let me clarify I bit. Prior to my switch to green beauty, I was used to the big stores (Sephora, Ulta, etc.) and nothing more. I felt like I never really bought much that was unique, instead purchasing products that it felt like everyone else was using. When I switched to green beauty, it opened me up to stores that offer a much more specialized collection of products, ones that I not only know I can trust, but I also know they will work. Whereas with Sephora I always felt like I'd just wasted my money, I have never felt that way with my picks from green beauty stores, which not only made the change to green beauty easier, but also far more worthwhile. So, why am I rambling on, you ask? Well, today I'd like to introduce you to one of those previously-mentioned superstar stores. Amazingy Boutique is a fabulous little online green beauty store that is actually based out of Europe, but ships worldwide. That last part is pretty lucky for lil old U.S.-based me, because this particular boutique's selection is, in a word, exquisite. Gressa Skin? Check. Yuli Skincare? Also check. I can shop all of my favorite brands at once, and have them shipped to me immediately. Does it get any better for a green beauty addict like me? I think not. There's actually two products that the boutique sells which I've been testing out for awhile now, so I thought it was about time that I shared my thoughts about them. I cannot even tell you how long I've been wanting to try out this body oil from the (always fab) Kahina. I feel like I've been reading about it for ages now, and each time I read about its wood-y floral scent, my interest was only piqued further. Once I got my first whiff of this dreamy formula I knew I was in love. It is truly the perfect balance between spicy, wood-y and floral, creating a fragrance that is totally unique. But, let's step back for a second and focus on the hydrating properties behind this oil, because that's what the body serum's real intent is. We've got watermelon, olive, coconut and sunflower oils in this super-hydrating bottle, which I've found to perfectly complement each other to create an oil that's both very moisturizing while still absorbing ultra-quick. For me, that last part is key — while I need some serious hydration, I find that that is a lot easier to come by than a body oil that doesn't sit on top of my skin for hours. I'd compare this one to my (equally beloved) BeautyCounter Rose Neroli Body Oil, which I also find to have the perfect balance of smelling fantastic, creating hydration and absorbing quickly. All in all, I couldn't be happier with this one, and am inclined to add my own rave review to the mix. To say I was excited to try this little gem out would be an understatement. Waiting for its arrival at my doorstep, I was like a kid (or, my 24-year-old self) on Christmas Eve. You see, I had heard raves about this product that rivaled almost any other skincare product I've seen before. Seriously. 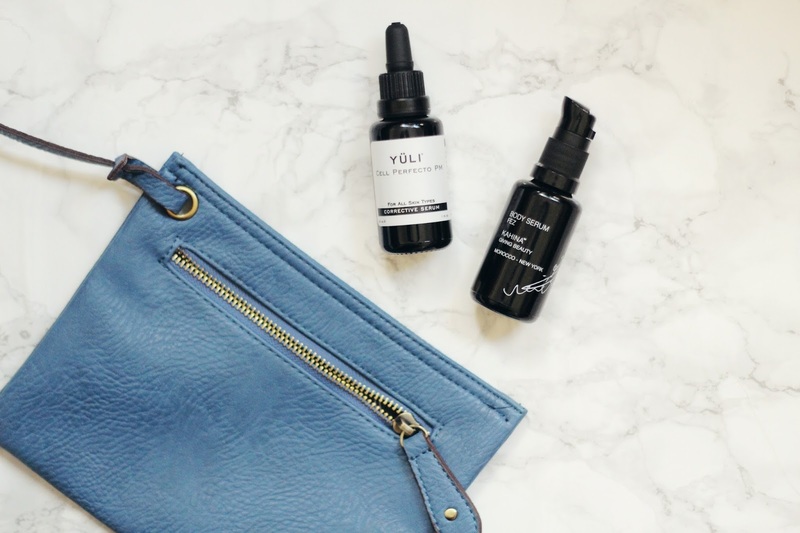 This little one-ounce oil has been touted by many as the "next generation" of skincare and, having tried and loved many other products from Yuli, I was definitely curious to try it for myself. Meant to correct dark spots, hyper pigmentation, acne scars and more, the formula for this oil is truly unique. At its base, you've got sea buckthorn, helichrysum and frankincense, three oils that I knew would soothe and hydrate my complexion before even trying. But, what makes this oil especially unique is its addition of gotu kola extract, as well as plant peptides and minerals complex. These ingredients add an almost brown sediment to the otherwise yellow oil, so you want to make sure to shake the bottle up well in order to get these key ingredients on your face. After several weeks of using this, I'm sure you want to know if I've seen any difference in my skin. Well, let me start by saying that my major target when using this were my acne scars, which I don't have a ton of, but do have enough of that I'm a bit self-conscious. Did my acne scars disappear? Not completely, but from weeks of using this religiously I have seen a definite improvement, perhaps a more dramatic one than any other skincare product I've used, a statement I don't write lightly. That being said, I genuinely think that the key to this product is time, which is why I'm excited to continue using it and seeing results. You will absolutely not see a difference overnight, but whether you use this as a spot treatment or all over (which, technically, you aren't supposed to do, but I do) you will notice an overall improvement in your skin over time. Or, at least, that's what I found. So, all in all, was my excitement worth it? A big ol' yes! Whether you're based in the U.S. or in Europe, I would definitely recommend giving Amazingy Boutique a look. They have brands from both continents, which allows green beauty lovers from all over to shop with ease. I know I, for one, have yet to find brands like Kahina and Yuli Skincare sold in one place before, so finding a store that allows me to have a one-stop-shop is pretty awesome, if I do say so myself. The Yuli oil sounds fabulous! I've been using 4% hydroquinone to deal with hormonal hyperpigmentation, but something more natural sounds a lot more pleasant!